Well, the answer is yes, it is possible to get fast-paced performance in a PC that is portable at the same time. But it won’t be as simple and as cheap as you may think. It is a known fact that one of the fastest modes of connection from your mobile device to your PC is via USB 3.0 ports. The problem is that most of the portable PC’s out in the market right now, such as netbooks with 11-inch or less sized displays, are not equipped with USB 3.0 ports, since their motherboards are not compatible with the hardware directly installed, mainly because of the limited space. While USB 3.0, when it is available on a computer, while provide great advantages of speed and power, if the computer only has USB 2.0, you can use USB 3.0, but it won’t have any of the advantages. It takes installing hardware to get the full power of USB 3.0! A Matrox Thunderbolt docking station allows users to get a singular Thunderbolt input while also giving a multitude of outputs like HDMI and USB 3.0 as well as Ethernet and audio connectors. It may hamper some of the portability of the entire set up, but at least you have the option of hooking up different devices at the same time. If you don’t prefer purchasing a Matrox product, then you could also get the Belkin Thunderbolt Express Dock. 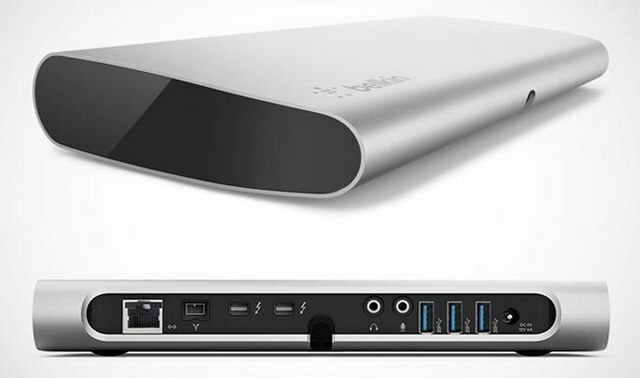 Compared to the Matrox dock, the Belkin Thunderbolt allows you to connect three USB 3.0 devices and one FireWire 800 device at the same time minus the audio jacks and the HDMI option. In the end, it boils down to what suits you the most. If you prefer having HDMI and Ethernet, Matrox is something you should consider buying for your portable PC. But if most of your devices require a USB 3.0 port, you should just wait for the release of Belkin’s Thurderbolt Express Dock, which might be the most suited device for your computing needs. This entry was posted in USB Hub and tagged Belkin, Matrox, superspeed, USB 3.0, USB 3.0 Dock. Bookmark the permalink.